The half-tubular arch of the Quonset hut is immediately recognizable for its elegant simplicity and as a monument to America's quick thinking in times of crisis. Originally designed for the military during World War II, the Quonset is a very useful design. If you need a quick, inexpensive building that will stand up to extremes of weather and the environment, here's how you can build a Quonset hut. Buy or fabricate metal arches the desired height and width of your proposed building. Since these arches are semicircular, the height will always be one half of the width of the arch. Put down a foundation of wood or concrete if your building needs call for it. 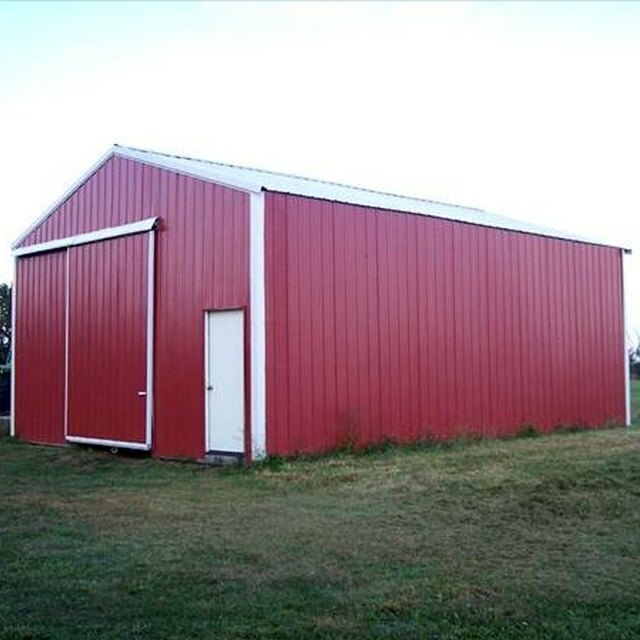 A barn or storage shed may not require any kind of floor. Erect your arches per the manufactures directions. Generally the arches will be spaced from 3 to 5 feet apart depending upon the expected use of the building. Place roofing panels horizontally across your arches, self-tapping roofing screws with rubber washers help to keep the weather out of your structure. Seal the panels where they overlap with a high quality silicone sealant for further weather-proofing. Prime and paint the exterior of your new Quonset to ensure years of maintenance free use from your affordable all weather building. Fabrication of metal arches requires extensive knowledge of metallurgy. Heavy gauge galvanized steel panels offer a high level durability and protection from the elements in Quonset hut design. Buildings that may need to deal with the weight of large amounts of snow would require the arches to be placed closer together during assembly.